Scientists, General Public Have Divergent Views On Science, Report Says : The Two-Way A Pew Research Center study shows that the two groups disagree most strongly on the safety of GM foods, the use of animals in research, climate change and human evolution. 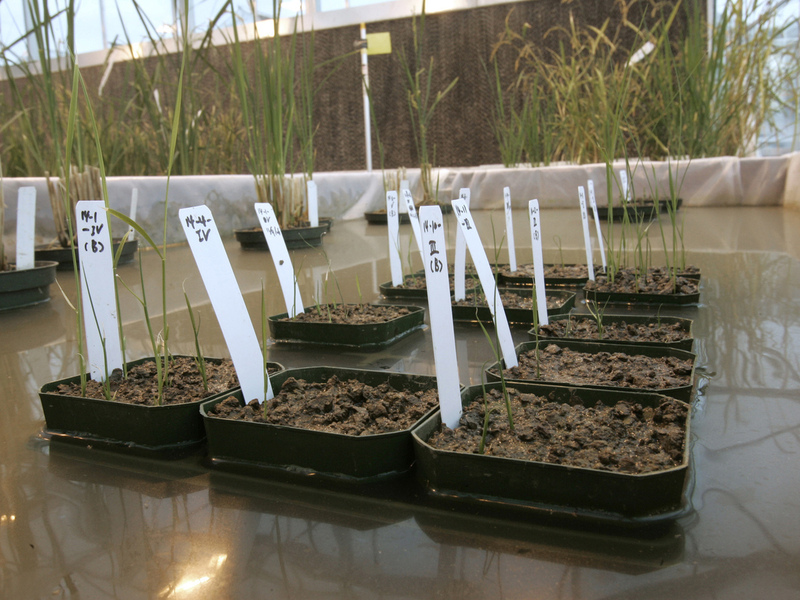 Genetically modified rice plants are shown in a lab in 2006. A new report from Pew Research shows a wide gap between perceptions of safety of GM foods between scientists and the general public. U.S. adults see various science-related topics much differently than do America's top scientists, with the two groups expressing widely divergent views on the safety of genetically modified foods, climate change, human evolution, the use of animals in research and vaccines, according to a new report published by Pew Research Center. The report, Public and Scientists' Views on Science and Society, was based on surveys of a sample of U.S. adults and, separately, a survey of scientists belonging to the American Association for the Advancement of Science, or AAAS. The findings were published today by the Pew Center's Internet, Science & Tech. According to the report, the public is much less likely to view GM foods as safe to eat than the AAAS scientists (37 percent to 88 percent), even though 67 percent of the nonscientists surveyed acknowledged that they lacked a "clear understanding" of the health effects of GM crops. Other topics with the widest gaps between the views of scientists and nonscientists include a 40-point gap between the two groups on whether eating food grown with pesticides is safe or not. Only 28 percent of the public believes it is "generally safe" to eat such foods (68 percent say it is "generally unsafe"), as opposed to 68 percent of the scientists who say it is safe (31 percent responding "generally unsafe"). Should animals be used in scientific research? Half of U.S. adults surveyed said no, a view expressed by only 9 percent of the scientists. Although the divide on the subject of human evolution was slightly less wide than on some other topics, the unanimity of thought among the AAAS scientists was notable: 65 percent of adults surveyed say that humans evolved over time (31 percent say they "existed in present form since [the] beginning"). But among scientists, the split was 98 percent to 2 percent. Overall, nearly a third of the public says "scientists generally do not agree" on evolution. However, nearly half of the people who say they do not believe in evolution also thought scientists disagree on the subject. Of the AAAS scientists surveyed, 86 percent say that parents should be required to have their children vaccinated, while only 68 percent of the public believes that. Finally, on climate change, there was a 37-point gap between the two groups surveyed. Eighty-seven percent of the scientists say that the Earth is getting warmer "because of human activity"; only half of U.S. adults agree. Just 9 percent of the scientists say climate change is the result of "natural patterns" — an answer that 23 percent of U.S. adults surveyed gave. Likewise, one quarter of the public says there's "no solid evidence" of climate change at all, a response that only 3 percent of the scientists gave. Lastly, more than three-quarters of AAAS scientists called climate change "a very serious problem," while just one-third of the public thinks so. Given the views expressed by the general public, it isn't surprising that 84 percent of the AAAS scientists describe the public's lack of understanding of science as a "major problem." Just over half of the scientists surveyed say media oversimplification of scientific findings is a problem; nearly the same number say "the public expects solutions too quickly." You can see a breakdown of the methodology for the surveys here.